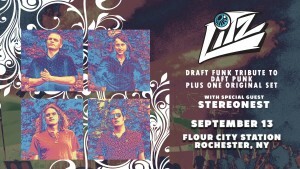 LITZ plays DRAFT FUNK A Tribute to DAFT PUNK plus one original set! LITZ brings together a wide array of musical influences ranging from funk, jam, go-go, soul, electronica and just about everywhere in between to amalgamate a new sound for the ears of the world. Their sound strides to sonically transport it’s listeners to another planet free of the stress, struggles, and tribulations of modern day life through the use of funky horn riffs, wah-wah keys, pounding bass, driving/progressive rhythms and melt your face guitar. Stereo Nest uses the singular human mind as the central processor between thought, freely controlled looping machines, and electric guitar. Live creations of electronic sounds move amorphous within a non-mechanical format, bleeding life into the circuitry, aiming for symbiosis between man and machine.